Ahead of her debut at Paris Haute Couture Fashion Week, 18-year-old Taleedah Tamer has landed her first international magazine cover for Harper’s Bazaar Arabia’s July/August issue. 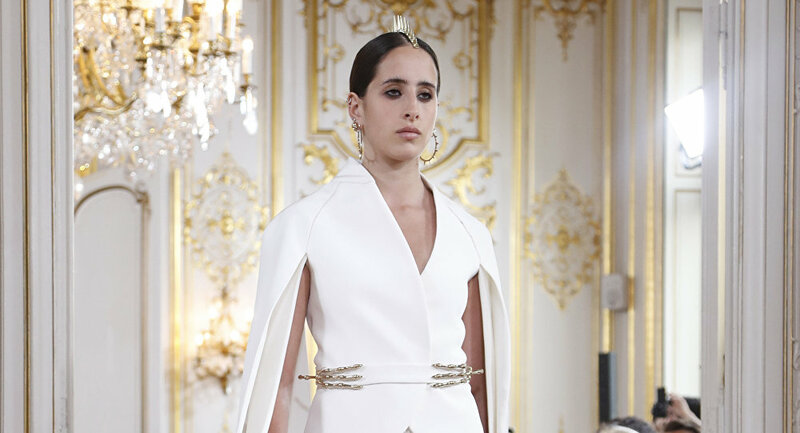 Taleedah Tamer, born to an Italian mother and a Saudi Arabian father, made waves this week as she became the first Saudi model to walk the Paris runway, having opened Italian designer Antonio Grimaldi’s show. The teenager turned heads as she dazzled in a pale pink column gown with a feather accent on one shoulder and a white pantsuit with a cape and slit sleeves. “I know there will be Saudis that will not agree with me modeling. I respect their right to have an opinion, but I also feel very proud that I am able to broaden perceptions of what it means to be a modern Saudi woman in the eyes of the world,” she said. The model said that after the show she was planning to return home to get her driver’s license, since Saudi Arabia recently changed legislation to allow women to drive cars. Taleedah’s mother, Cristina Tamer, used to be a model who worked with top-notch brands, such as Giorgio Armani, Ferre and La Perla, while her father, Ayman Tamer, is a chairman of Tamer Group, a health care, pharmaceutical and beauty company. The combination of her Saudi and Italian heritage has led Taleedah to her first international magazine cover for Harper’s Bazaar Arabia’s July/August issue. “When I first started modelling I never thought that I’d be the ‘first Saudi model,’ but it seems like the perfect time for the industry to open up. When I was younger, it didn’t cross my mind not to see Saudi women on magazine covers or in fashion shoots. But as I got older, I thought ‘why do these women not look like me?’ And why can modelling not be done in a way that’s respectful of our culture?” she recalled. Taleedah currently has some 12,000 followers on Instagram, but her recent career boost is likely to drastically increase her following.